Here we go, an officially sanctioned movie poster for one of my favorite sci-fi/action movies of all time: TERMINATOR 2: JUDGMENT DAY. In all honesty, I’ve been wanting to design this poster since I first saw the movie in 1992 when I was 15. I absolutely loved the design of those Endo-skeletons, probably my favorite piece of cinematic “monster” design ever to appear onscreen. As per usual, when the movie ended I doodled the metallic skull design on a piece of typewriter paper. Wish I still had it. So, when the top brass at Mystery Box notified me that they wrangled an official deal to do a T2 poster I was pretty excited. I knew that skull would be front and center. Here is a scan of my initial concept sketch and the first digital mock-up as I figured things out. A bit of a back story. If you are a frequent visitor to my blog you’ll know that I’ve been chasing movie poster design for about a year now. Signalnoise has had it’s ups and downs in terms of making these available to the public, several will never see the light of day in terms of sale. A few incidents happened along the way that knocked us back, but the designs still exist which is ultimately what counts. But, Mystery Box has been persistant in hammering at this idea for months now and things are snapping into place. We’ve inked a few deals to do some movie posters all official, titles you have definitely heard of, the first of which being this T2 poster. This one will be moving into production real soon and we have a special variant edition planned. Man, can’t wait. This one will be available via the Mystery Box storefront once live. Once again, we’ve teamed with the kind gents at the Prince Charles Cinema for their screening of TERMINATOR and TERMINATOR 2 on August 29. Be sure to follow Mystery Box on Twitter to keep up on all the latest releases from me and the other artists. There will be some fun stuff coming down the pipe soon. 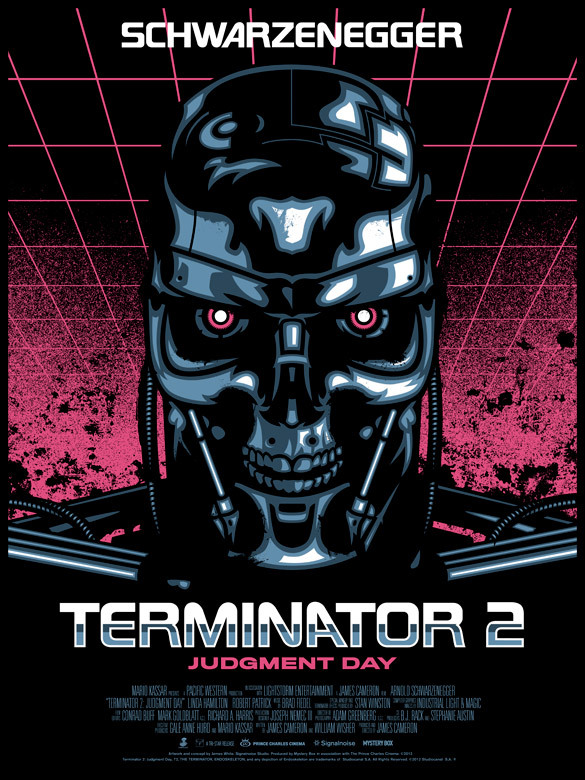 Watch this space as we bring the TERMINATOR 2 poster through the printing process. I have to like it on Facebook for the thumbs-up. Not sure about 2 things – the “DVD cover” composition and pink. 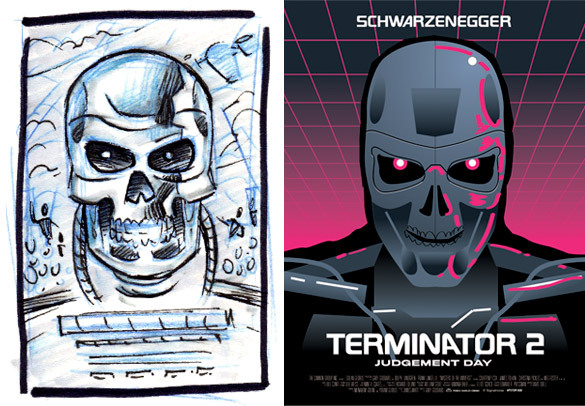 I know pink is your hot colour these days but it somehow doesn’t fit Terminator for me. Nice work Whites! I watched that zillion times back in the day. I remember it played at the old theater on Prince St. for an eternity. Fabulous work! That is just screaming for metallic inks. I hope I’m lucky enough to grab one of these when they are released. wow awesome job as always James. Only concern is with the “schwarzenegger” at the top the first “a”, the first “r”, and the last “r” are filled in with a lighter colour in the holes in the letters. Otherwise it looks awesome and fits your style really well. Keep rockin’ man!! Matt – I mentioned in the post why the posters aren’t for sale as yet. We hit several different snags while pursuing these, legal and otherwise. But things are now snapping into place. James, you just can’t go around killing posters. Probably one of my all time fav movies. Great work James. Love the old neon pink and black look. This is amazeballs, congrats, you’ve done it again! And silly but hopeful question: is there anyway we’re going to be able to get our hands on a Drive poster again? When I went in for the buy, it was gone… is it forever? This print is amazing, love the style and concept, but dude, there’s no way these are legit and ‘official’. You would not get rights to all the actors you named in the credits, let alone Arnie. You REALLY need to protect yourself from a serious lawsuit or your poster days are going to come to a abrupt halt. Ryan, my agent inked a deal with Studio Canal (the people who own the property) to do a limited run of the poster. That’s the official credit block, pending approval from the studio to ensure we have proper names/titles in place. Nothing in this post is untrue. PS. You do need additional rights to use actors’ likenesses on posters, but as you can see no actors appear in this design. I disregard my previous comment then. i apologize. I did not know you could use an actors name (screen actors guild nonsense) on anything, unless you had approval.. photo of them or not. crazy cool print.. I just hope this isn’t another false hope.. you can’t keep pumping out epic artwork that I cannot get my hands on. No worries Ryan. Appreciate the concern man. Nobody has been more frustrated with the lack of printed posters than me. I invested a lot of time creating posters this year and the vast majority can’t be sold because of one reason or another. It’s been a real bummer. Now that you put it that way James, you’re right. Frustrations are on both ends for sure. Thanks for the consideration Ryan. I appreciate the eyes on my work. I was going to throw in the towel on movie posters but luckily we snagged a few official deals to do some cool posters in the next few months. Long time coming, but going to be fun.